If our individual life is a mystery in itself, the life of a group, of a human system, is an even greater one! 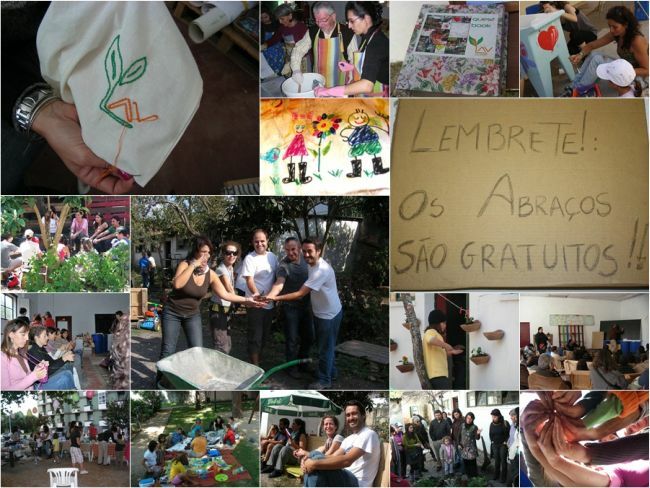 ITLAV, the Transition Initiative of Linda-a-Velha (in Portugal), would like to share our story of our particularly unique and mysterious path, one that invites us to reflect deeply on the mysteries of human nature, of relationships and of what really matters, of what is essential in order for us to thrive. We have no idea if our findings will resonate globally, but we are proud to announce that for us, thriving is about ‘Neighbouring’, a new verb that we invented! We began as a group of people mostly unknown to each other, who felt called by the appeal of the Transition Movement seed one of us had planted in the neighbourhood. From our first steps to the splendor of group action there was a short distance in time, less then six months. A space was lent to us by the local authorities and therefore our weekends and our energy were split between restoring and setting the place up, using in with workshops and other activities and group building, being together. In such circumstances, getting sidetracked into just ‘doing’ things was an inevitable temptation! There was so much to do and we had an infinite waiting list in terms of dreams and projects for the space and for the group itself! Despite the efforts of the one who planted Transition’s seed in Linda-a-Velha (lets say, our gardener) to warn and remind us (and himself too) of the dangers of quick action, we found ourselves faced with burnout and many other questions which could perhaps be summed up in the dilema: Old Way of Doing Stuff versus New Way of Getting Stuff Done. We found it very hard to resist the old temptations! … we weren’t inactive, but we were separated… something was missing! Time was needed, persistence was needed, acceptance was needed, confidence was needed and the ability not to lose sight of what we craved for, of what felt once so good. So we became an active neighbourhood, a resilient and caring one, where mothers could count on each other to pick up their kids, where hanging out together was a huge pleasure: a party here, a dinner there, a nostalgic conversation, everybody moving forward on their own things and finding each other frequently. Then one of us brought from the Transition Thrive Workshop the ‘Transition Health Check’ tool. It was absolutely beautiful to see us all together again, analysing our weaknesses and our strengths, how we could readjust our understanding of our track together in a more balanced way, like if we were just admiring how our journey’s river swirled and flowed up to here. But most of all it was such a delight to laugh and joke about our past, how mature we were now in our relationships to the point of being able to speak in such a supple and humorous way of our hardest bits! How much we grew together! To form and to be part of a Transition Initiative was like getting on board on a journey to the unknown. I’ve no clue if we did find what we expected, if we landed where we wanted to, but in those two Health Check Saturdays we definitely realized how far we had come together and what a beautifull place we now found ourselves in! We were neighbours and friends, united in a strong net resilient enough to survive the challenges we had gone through. We were, and still are resilient people! 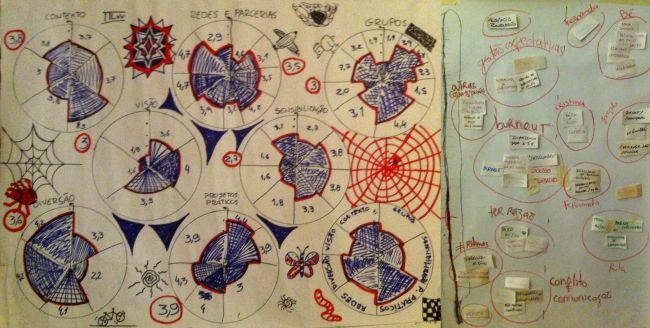 The Thrive Health Check wasn’t enough, it didn’t pull out the delicate things that had made us collapse, it didn’t aproach invisible structures and group malformations, so we decided to design and try our own inner analysis tool. Again it was just great! It really helped us to understand and acknowledge together what had led us to drift apart as a group. Personally, the most powerful moment was the one where we had the chance to bring about our own features and personal choices that could have, or did, contribute to our descent. It was as if finally the magnetism of that dark invisible ‘Thing’ that still existed among us disappeared. To finish our group healing: a dinner party! Most recently we recieved Sophy Banks here and prepared an Inner Transition Workshop. Sophy also offered us a Revitalise session that made us understand clearly how resilient and engaged we are with this thing of being Transition neighbours! From then on, it has been a soft and cherishing process of rebuilding group dynamics – we have no Instruction Manual about how to do so, I guess no one has! So we have just used our inner guidance and tried to feel when the time is right for what. We have been dividing our time between mingling, preparing a few events and observing and restructuring our group agreements and our vision of what do we want to do and become as a Transition Initiative ! It’s 100% experimental and often looks like a couple that broke up and decided to get back together again! We are trying to learn our way towards a healthy and sustainable ‘reconciliation’, while juggling all the other challenges and needs that our individual and family lives encompass. And yes, that is the mystery! How to do it gracefully and effectively?! We know we want to be together to ‘neighbour’, but we also know that we want to come together to be and do the change we want to see in the world. Most of all, we know that without one of these two ends we are incomplete! Then draw a big vertical thermometer all along a flip chart. Invite people to question themselves individually about “What weakened the group? What inherent tendencies and what group behaviours have shown to promote dificulties and conflicts?”. Keep answers simple and short, in a key words mode. Each of you add your outputs (Post-it notes can be great for this) on the thermometer according to their feeling of how serious, how hot the issue is in a scale of gravity/temperature. Later reassemble the pieces in terms of groups of issues, and you will get the main issues of the group. This can be reflected upon in whichever way the group feels is best. We just chatted about the subjects each one brought, while reading them out loud. You can even begin to explore what kind of group culture and group agreements could help maintain a healthy group and avoid entropy. Or you could leave this to another opportunity, because it will certainly take a long time to do well. We chose the second option. After this, a similar question is posed at an individual level: “What features of mine and what personal behaviours might have added to our group difficulties and conflicts?” Each person puts their Post-its again on the thermometer. If the safe space and the will arise, you can use the opportunity to express about what you might have brought to the group that didn’t serve you all the best way. It can be extremely liberating and group energy transforming to do so. Do not take long in this phase, do not disclose deeply to avoid places of excuses, reproach and guilt. Just honour the beauty of being exposed and vulnerable of those who disclose themselves and receive them with the heart, as well as disclose from it. Use a nice and positive tool for the closing moment. I like the ‘Bowing to our Adversaries’ from Joanna Macy. It mainly consists of doing a series of bowings along with expressing our gratitude and reverence to those people and situations that due to their adverse and defying nature, enhance and make us learn about our qualities, and help us as well to get in touch with our human greatness when we experience connecting compassionately with them, with their actions, its consequences and the emotions it produces in us. By Rita Afonso and the rest of the ITLAV team.